It’s still really hard to get a mortgage in America without a perfect credit score. That’s the takeaway from has a new economic letter put out by John Krainer and Erin McCarthy at the San Francisco Fed. The authors think that mortgage lending standards are still too tight for those without great credit scores, and that might be holding back the housing recovery. 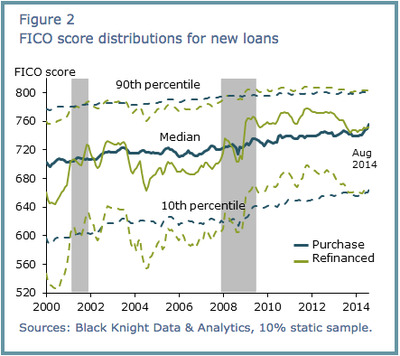 From a survey of lenders, the authors find that after the recession, lending to borrowers with good credit picked up pretty rapidly, but lending at the lower end of the market is still stalled. On the one hand, this is bad for the housing market, and probably holding back a little bit of economic growth. On the other hand, extreme easing of credit standards on subprime mortgages is what got us into this mess in the first place. 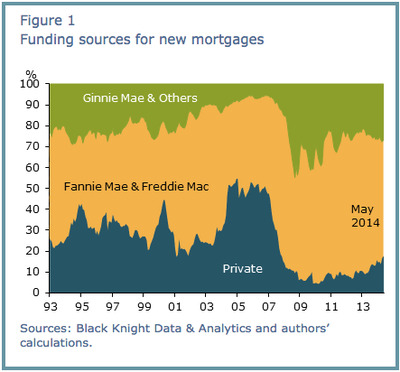 A particularly important point is that bank-funded jumbo or nonconforming loans do not have any substitute readily available elsewhere in the mortgage market. To the extent that this type of lending is making up an increasing share of new mortgage lending, there appears to be some evidence that constraints on credit access are easing somewhat at this end of the market. In addition to an increasing share, the interest rate spread for jumbo mortgages began to narrow towards the end of 2013. The drop in rates coinciding with the increase in the jumbo share suggests that the supply curve of the banks has shifted in favour of holding these loans.